I'm trying to replicate the Nixie clock designed by Kevin Lee (https://0x7d.com/2017/nixie-tube-clock/). It uses a NXP PCA9685 PWM controller and a MSD42WT1G BJT to drive each tube cathode separately. The PWM signal is 5V and the voltage drop on the tube (when a cathode is conducting) should be around 133V. I don't know the "HV DC" anode voltage. 1) When PWM out is high, the BJT is in forward active or in saturation mode? 2) If it's in saturation (as I think), why R1 is placed between emitter and GND, and not between tube and collector? but this should be possible only if in active mode, right? So the BJT is in active mode? If yes, why? 4) Assuming Vce negligible, the collector current is (HV DC - 133)/1000? 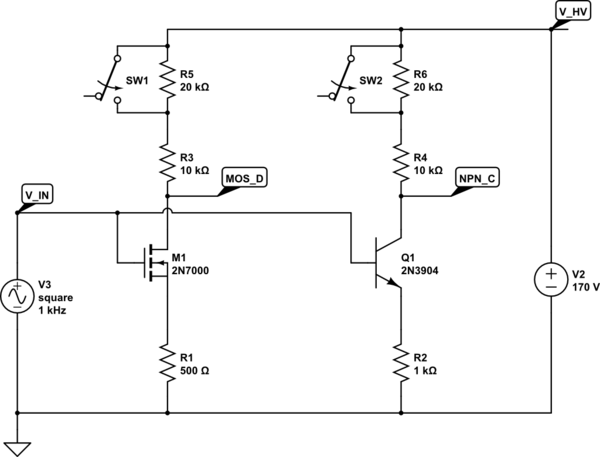 5) Is this the best way to arrange the circuit? 6) If the transistor is used only as high voltage switch, is it better a BJT or a MOSFET? I'm going to throw out a HV DC voltage of 170V for any calculations. Basically, the large emitter resistor acts as negative feedback, limiting how much current the transistor will try to drive through the Nixie tube. What is the mode of operation of the transistor? It depends (on the load). If the load of the Nixie cathode is "low", say 22kΩ, then the transistor will be in forward active mode. In forward active mode, the emitter resistor creates negative feedback to the common-emitter amplifier, limiting the current to about 4.4mA, as the author suggests. However, if the load of the Nixie cathode is "high", maybe 220kΩ, then the transistor will be saturated, and the current through the cathode will be less than 4.4mA. The emitter resistor provides negative feedback, limiting the maximum current that the transistor will attempt to pull. The typical way that I've seen current limiting implemented, with an anode resistor, would use a much higher value than 1kΩ. The BJT is most likely in active mode. Again, the emitter resistor is providing negative feedback. If more current flows through the collector, then it will also flow through the emitter resistor. A higher current through the emitter resistor will make the emitter voltage higher, reducing the voltage at the base, which will "turn off" the transistor. Assuming Vce is negligible, Ice will be limited by the emitter resistor to about 4.4 mA. I think it's probably fine. There is a certain amount of safety from using an anode resistor, as it will always work, and it simplifies the the cathode side electronics slightly. If the NPN fails short for any reason, then damage to the Nixie tube may occur (1kΩ is not large enough without the NPN). The real benefit I see is that multiple cathodes can be illuminated simultaneously, and each cathode current will be roughly the same (maybe equal brightness). 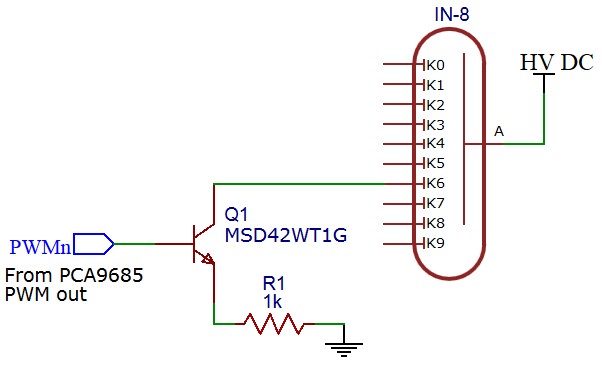 If the goal is to do fancy PWM transitions between digits, this circuit may be a better option. The way this circuit is designed, I would only use a BJT. This topology does not work nearly as well with MOSFETs when the same (logic-level) inputs are provided. Not the answer you're looking for? Browse other questions tagged bjt nixie or ask your own question. How is this BJT in saturation?